An osteopath uses osteopathy to treat and heal the whole person, by employing several techniques all involving a direct hands-on approach. The muscles and bones of the body are manipulated, in order to strengthen those areas (in particular the musculoskeletal framework) however the entire body is treated. Methods may range from spinal manipulation and massage to stretching and moving the joints in a gentle motion. Newborns to the older person can benefit from osteopathic treatment as it is gentle and free-flowing. 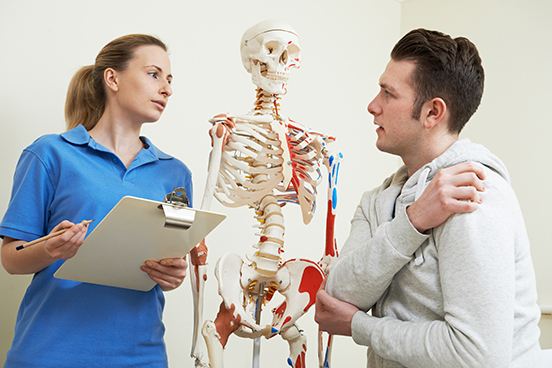 As with any practitioner, an osteopath will work closely with you, taking a full history and tailoring a treatment plan to suit you and your unique conditions. Every injury is unique and requires a plan that will work for that specific injury. And like many practitioners these days, an osteopath will treat the whole body – not just the muscles and skeleton, but the circulatory system, connective tissue, nerves, joints and internal organs – as they believe that all these systems play a part in injury management and healing. They believe the body is a whole unit, not a collection of individual parts, and as such treat the body as a whole; the musculoskeletal system works with and influences all other parts of the body. When the body’s framework is not properly aligned it can cause problems in far-flung places and the body is unlikely to be able to heal itself.